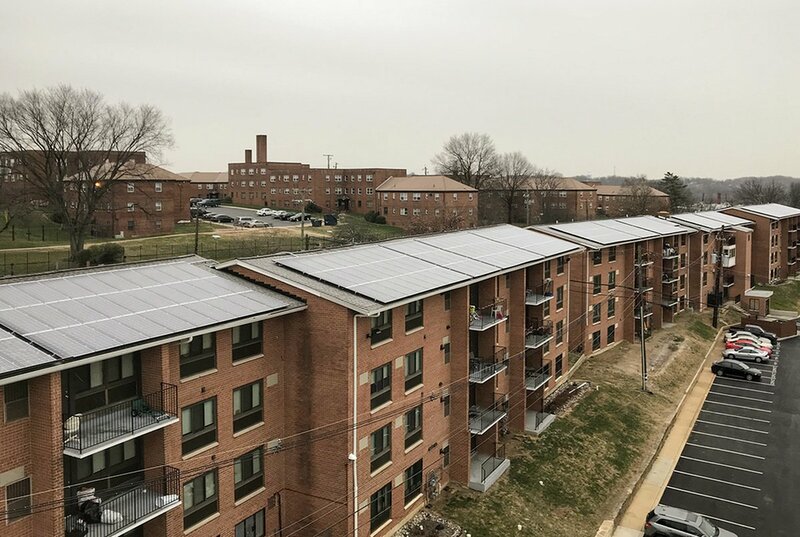 WASHINGTON, D.C. (March 8, 2018) WinnCompanies, an award-winning multifamily property development and management company, and the District of Columbia today announced the completion of the District's largest community solar project aimed at reducing energy bills for low-income residents throughout the nation's capital. Solar for All, a program of the Department of Energy and Environment (DOEE), seeks to provide the benefits of solar electricity to 100,000 low-income households and reduce their energy bills by 50 percent by 2032. 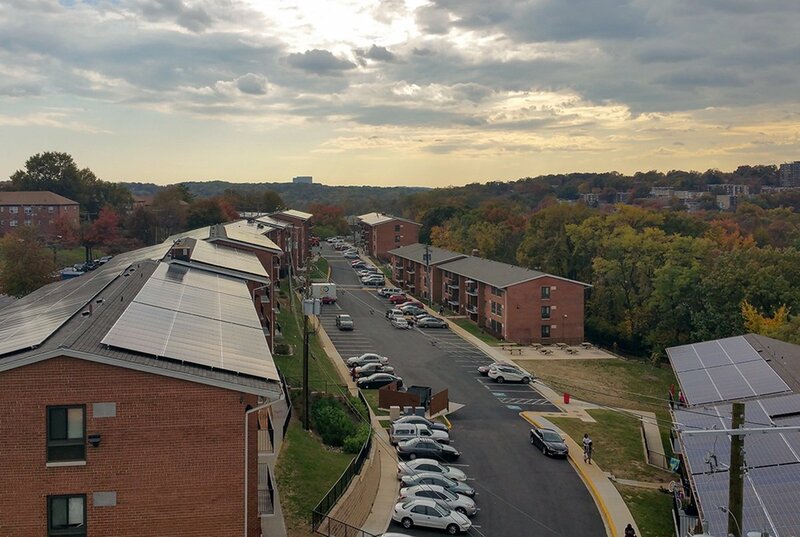 After being awarded a $1.3 million grant from DOEE's Solar for All program, WinnCompanies installed the 651 KW (DC) community renewable energy facility on the roofs of Atlantic Terrace Apartments, making it the largest community solar project in the District. The company is working to bring additional community solar projects online throughout the District in the near future. Community solar projects prove that solar is not just a luxury for those that can afford their own panels, but that solar can also work for renters living in multifamily housing, said Darien Crimmin, Vice President of Energy and Sustainability, WinnCompanies. This project will benefit nearly 200 income eligible households over the next 15 years, helping to create jobs, improve local air quality and showcase the success of the Solar for All Program for District residents. WinnCompanies will continue working with DOEE and Solar for All to expand the District's solar capacity and provide the benefits of solar energy to local communities, helping residents save up to $500 a year. The clean energy from rooftop solar panels installed at Atlantic Terrace will be fed into the District's utility grid through an arrangement known as net metering. The savings will then be passed back to qualified low-income residents through credits reflected on their utility bills. Solar for All provides a tremendous opportunity for our residents to take advantage of renewable energy savings, and we're excited to continue our work with WinnCompanies to expand the availability of solar energy for low- and moderate-income households, said Tommy Wells, Director, Department of Energy and Environment. This project brings jobs, clean energy and energy independence to the District of Columbia, and we hope our work serves as a model for success to communities across the country. WinnCompanies embraces environmentally responsible decisions, and is recognized in the multifamily industry as a leader in green development and the utilization of renewable energy. In the past decade, the company has invested more than $50 million in energy efficiency and renewable energy projects across its affordable housing portfolio, combatting climate change while saving money for residents and property owners. The solar installation at Atlantic Terrace occurred as the company was completing a $69-million rehabilitation project at the community and its sister property, Atlantic Gardens. The two-year effort not only completed modernized 303 apartments but also preserved both communities as critically needed Project-Based Section 8 housing for 750 residents. WinnCompanies acquired Atlantic Terrace in 1982 and has managed the property since. Built in 1964, it is comprised of 195 units in six three- to four-story garden-style buildings. For more information, visit SolarSavingsDC.com.